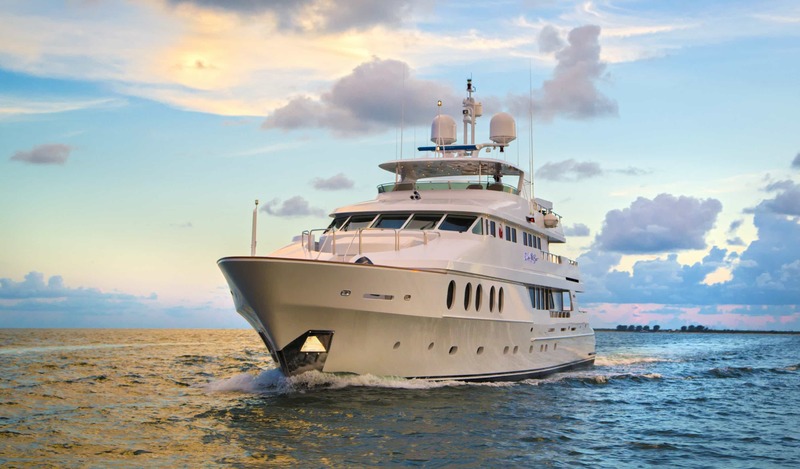 This 44m/145ft luxury superyacht was built by Christensen in 2002 and last refitted in 2018. 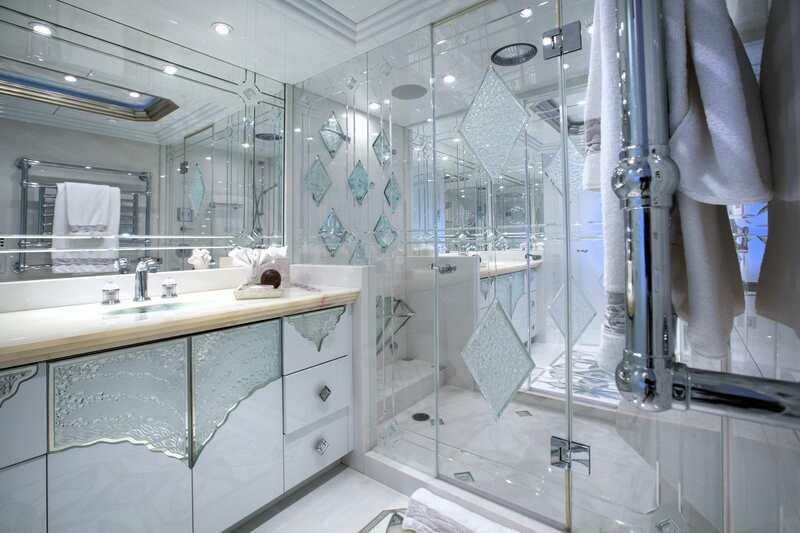 The naval architecture was completed by the shipyard, while the exterior and interior styling is the work of Paola D. Smith & Associates. The accommodation sleeps up to 10 guests across five cabins. 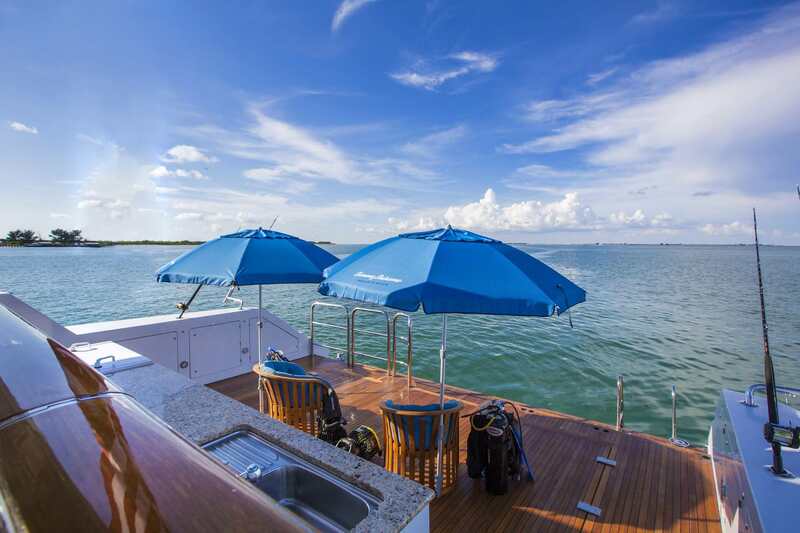 She has an attentive and professional crew of 7 making sure guests have a truly relaxing charter vacation aboard. The main deck aft is sheltered by the upper deck overhand and creates a casual alfresco dining area using a raised table and armchairs around the sofa along the stern. A bar positioned beside the doors to the main salon will provide refreshments, while down the stairs the broad swim platform can be used as a lounging space beside the sea. 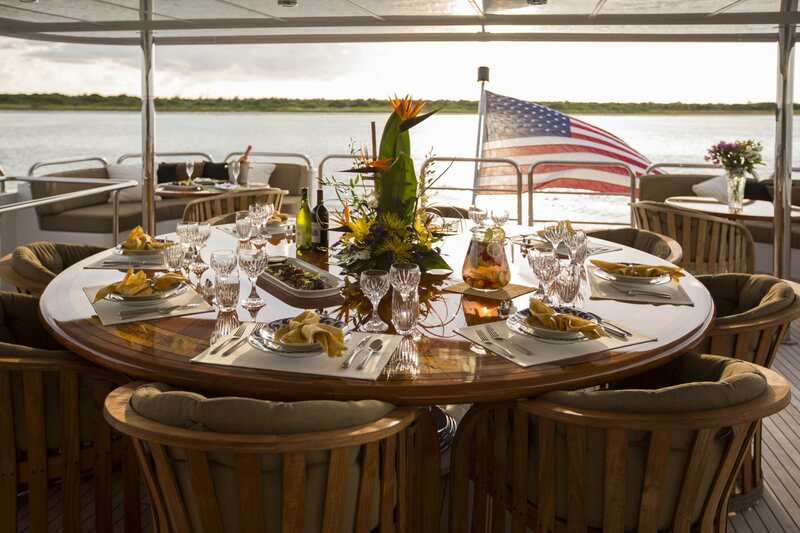 The upper deck aft has an elegant circular alfresco dining table to seat up to eight guests and both corners along the stern have a sofa and a drinks table for outdoor relaxation after the meal. The Portuguese deck is fitted with an integrated sofa and forward sunpads the enjoy sweeping views. 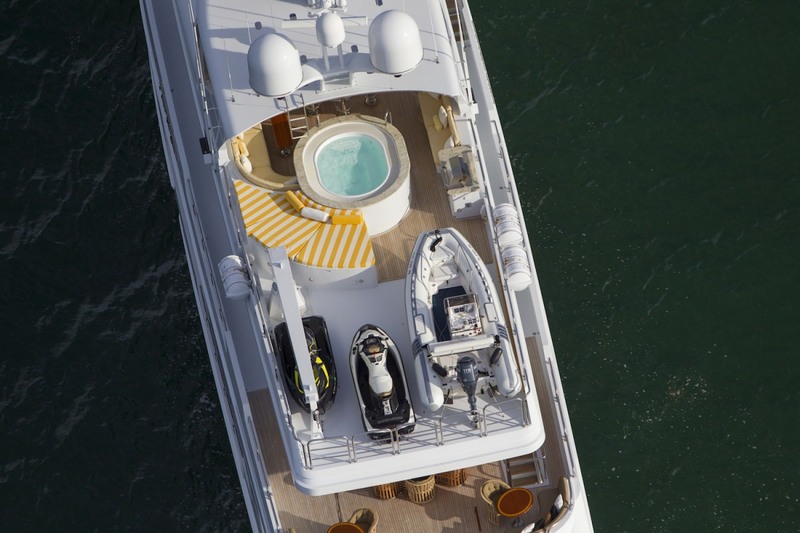 On the sundeck the tenders are stored to the aft and launched using a Davit crane. 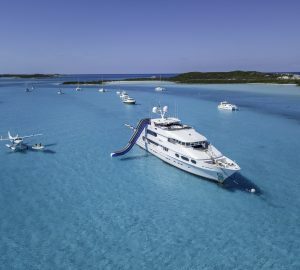 A generous Jacuzzi is placed centre of the deck with sunpads running around the port side and a barbeque grill starboard. 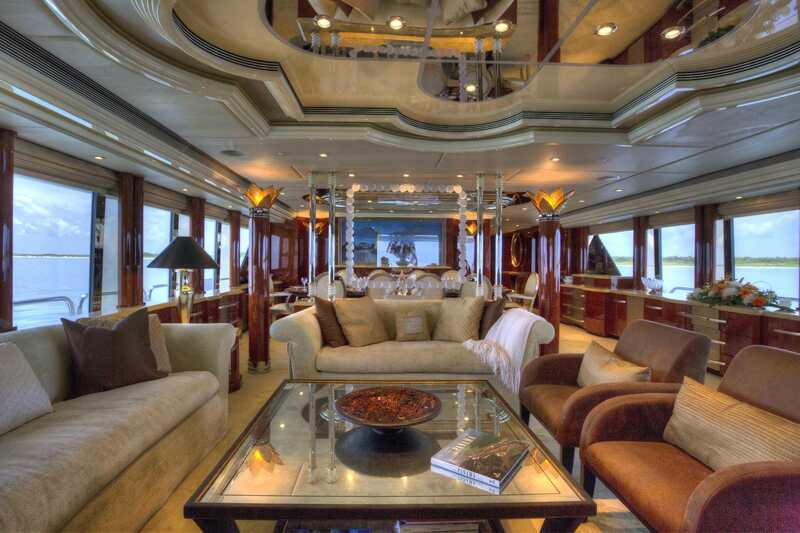 Under the shaded hardtop are two fitted tables with a drinks table and a forward breakfast bar. The lower deck stern contains the engine room with the guest accommodation forward, consisting of two double cabins and two twin cabins with en-suite facilities. The crew accommodation is within the bow. 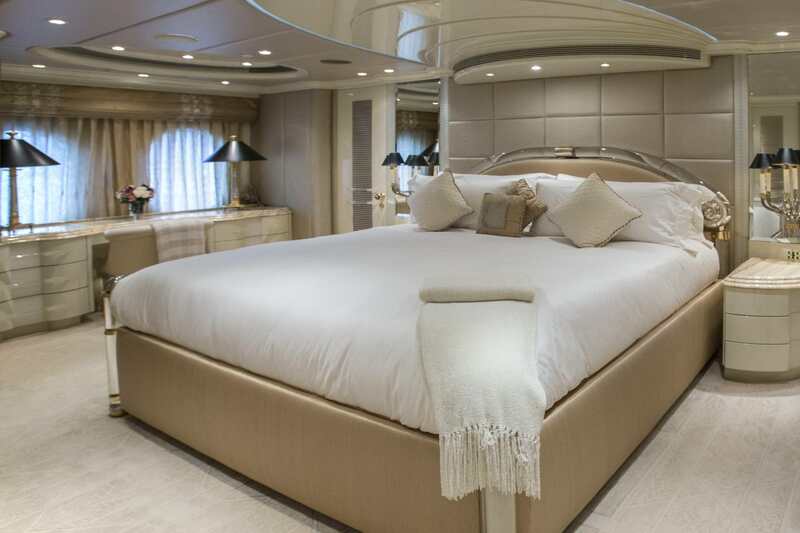 The full-beam Master suite is placed forward on the main deck, and the open-plan environment also includes a lounge, while the en-suite bathroom is forward and a study behind. The main salon provides a spacious environment with sofas and armchairs creating a conversational area filled with natural light further emphasised by the ceiling mirrors. 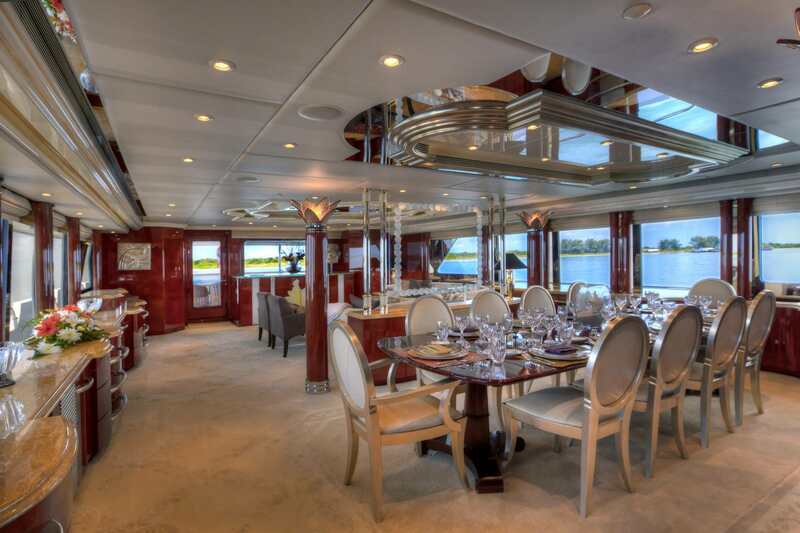 The formal dining area is placed forward and seats up to 10 guests in a mahogany-panelled environment. The upper deck sky lounge has a forward bar with an extensive selection of glassware and drinks to suit the occasion. The aft is furnished with a plush sofa and a games table beside the port window for the most natural light throughout the day and as a cosy indoor evening retreat. 2 x 2012 MTU engines produce a cruising speed of 10 knots and a top speed of 15 knots. The accommodation sleeps a maximum of 10 charter guests over 5 en-suite cabins: 1 Master suite, 2 double cabins and 2 twin cabins. The crew of 7 will be on-hand to ensure that everything runs smoothly on board. We do have available further amenity, owner and price information for the 44.20m (145') yacht 44M LUXURY SUPERYACHT, so please enquire for more information.